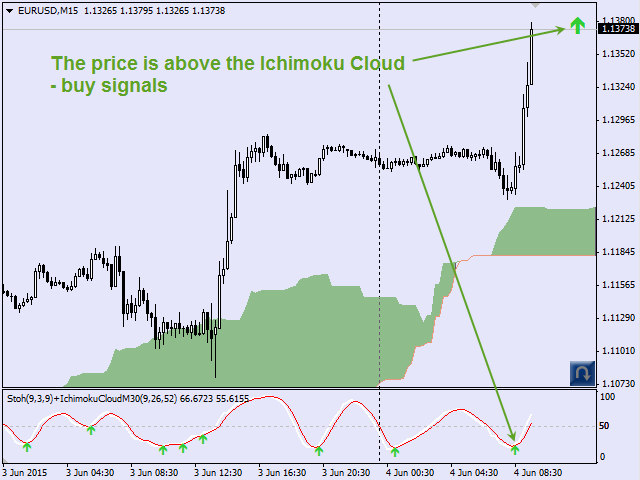 This indicator signals about Stochastic crossing in the trend direction which is determined by the position of the price relative to the Ichimoku cloud. 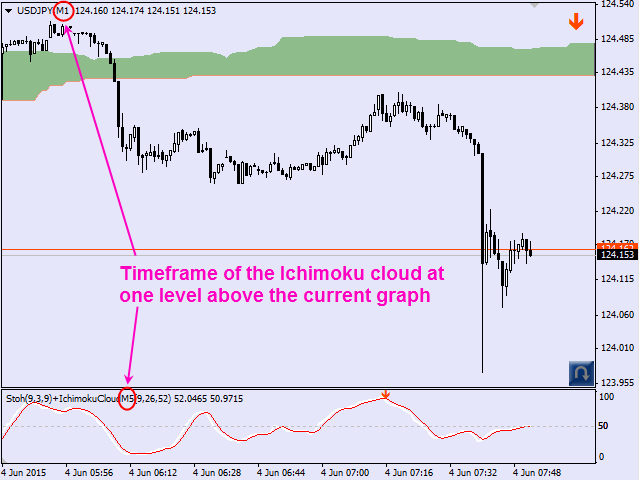 ability to use the Ichimoku cloud of higher timeframes (parameter "Timeframe of Ichimoku Cloud"). O - the price is in the cloud (flat: in this case the signal will not be generated). The signal is given not only when the bar is closed (formed signal), but also on the current bar which is not closed yet (probable signal). It gives you time to analyze the market situation and allows you to take a time when making a decision and calculating trade parameters. Emails and push notifications to mobile devices (parameters ON/OFF-Mail and ON/OFF-Push). 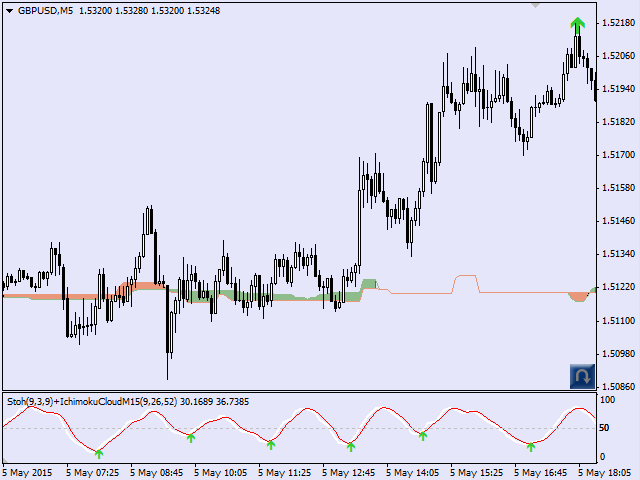 The indicator can generate a signal for early exit from the trade when lines of the Stochastic are reversely crossed (against the trend). Good results are obtained with default parameters, if you set a timeframe of the Ichimoku cloud one level higher than the current one. 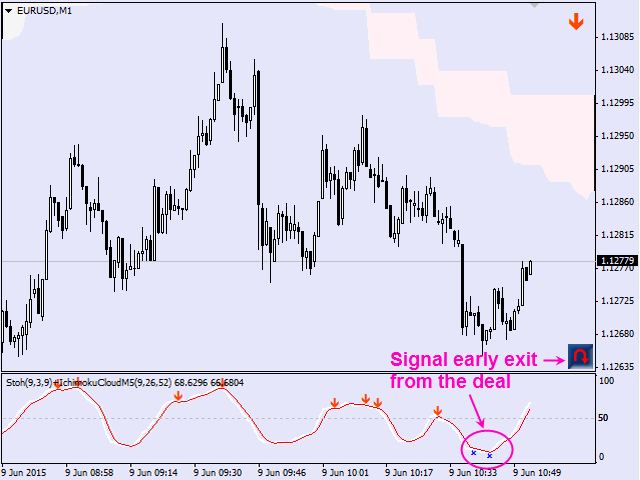 For example you attach the indicator to a chart with М1, and set the cloud timeframe (parameter "Timeframe of Ichimoku Cloud") to М5. 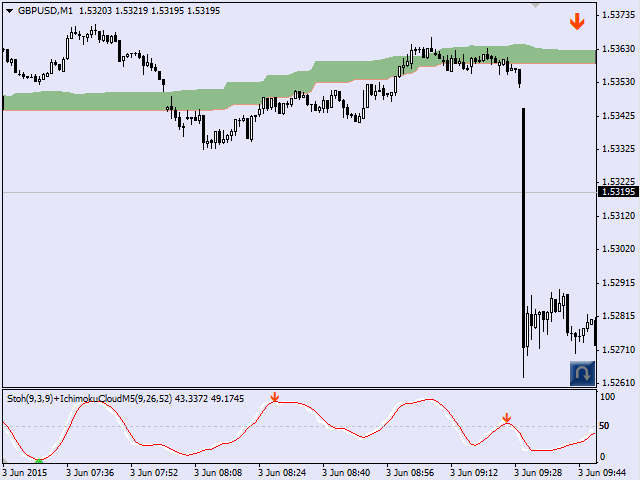 If a chart has М30 timeframe, set H1 as the cloud timeframe, etc. K Period - period for calculating Stochastic %K line. D Period - period of averaging for calculating the %D line. Slowing - value of slowing. BUY - the bullish bar only; SELL - the bear bar only - if =true, the signal bar must be bullish when buying and bearish when selling. Tenkan-sen - Tenkan Sen averaging period. Kijun-sen - Kijun Sen averaging period. Senkou Span B - Senkou Span B averaging period. Shift TF of Ichimoku relative to the current TF ( >0, <0, =0 ) – shift of the Ichimoku cloud timeframe relative to the current timeframe (can be =0, >0, <0). Value 1 means 1 timeframe higher, 2 means 2 timeframes higher. Value -1 means timeframe lower than the current by 1 period, etc. 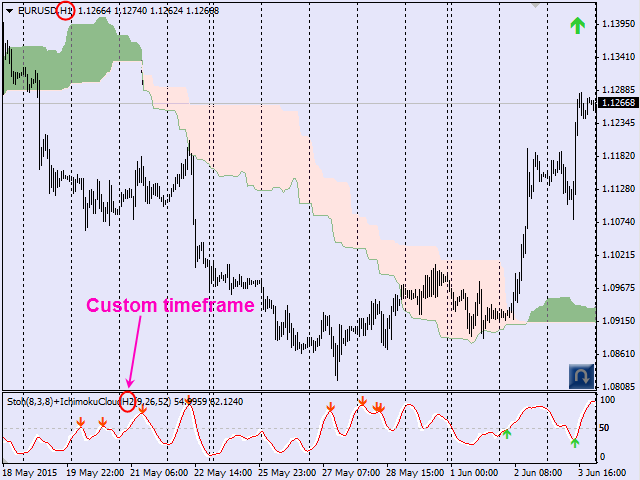 For example, when the current period is M15, if you set the parameter to 1, the indicator will display the Ichimoku cloud data on M30, and if you set it to -1, the indicator will display the Ichimoku cloud data on M5. Up Kumo color - color of the Ichimoku cloud during an uptrend (Senkou Span A is above Senkou Span B). 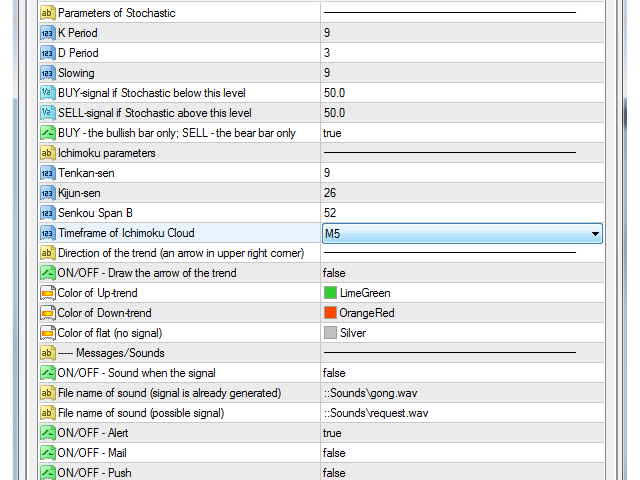 Down Kumo color - color of the Ichimoku cloud during a downtrend (Senkou Span A is below Senkou Span B). You can test the indicator's demo version here. очень хорошо, когда должным образом скорректированные параметры дает удивительно хорошие сигналы. 1. 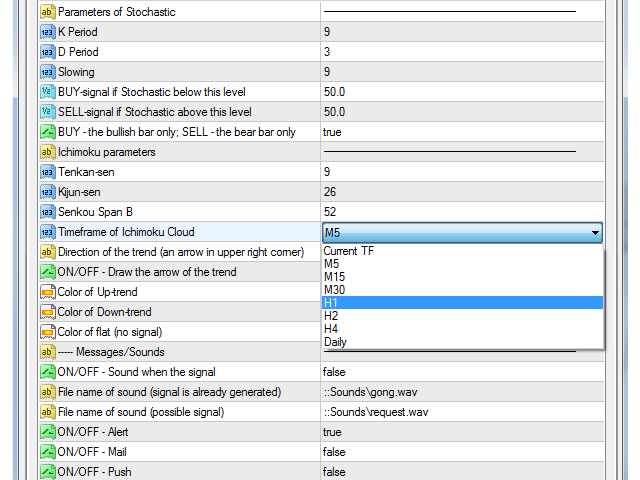 Added option to disable potential signal (the "Enable possible signal" parameter). 2. After the recent update, the terminal will not load the template with the Ichimoku cloud. Corrected. 1. 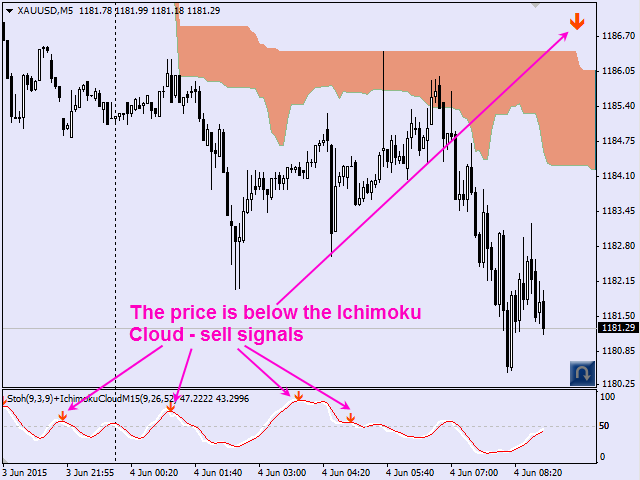 Many traders have been asking to display the Ichimoku cloud with together with the Stochastic in order to monitor the indicator operation. Unfortunately, the MetaTrader 4 terminal does not provide the ability to render indicators in the subwindow and in the main window simultaneously. 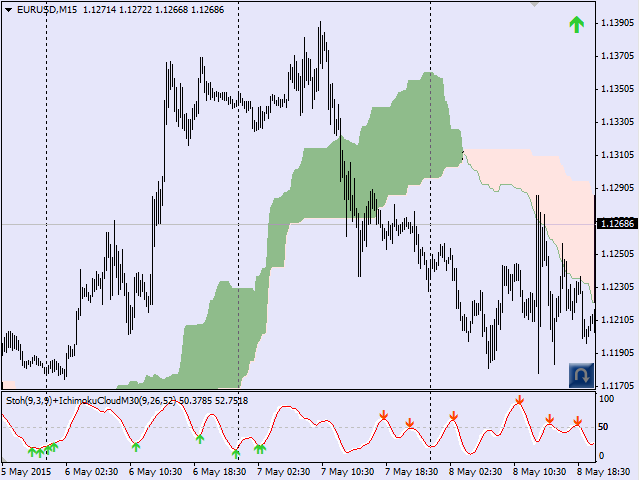 A way to override this limitation has been found - now the indicator is able to load both the Stochastic in the subwindow and the Ichimoku cloud in the main window. They are loaded using a template. 2. 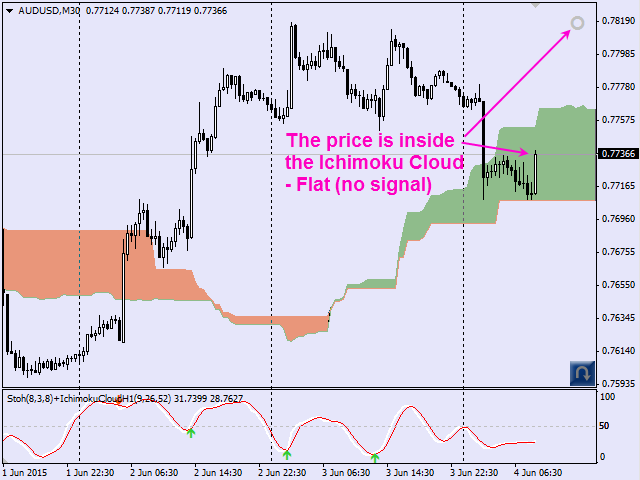 Now the timeframe of the Ichimoku cloud is set by the shift relative to the current timeframe (it can be =0, >0, <0). 1 means higher by 1 timeframe, 2 - higher by 2. -1 means a timeframe lower than the current by 1 period, etc. For example, when the current period is M15, if you set the parameter to 1, the indicator will display the Ichimoku cloud data on M30, and if you set it to -1, the indicator will display the Ichimoku cloud data on M5.